Love – every day's a holiday! With the boom of Pappy Hawkins’ gun, artist and writer Al Capp started a sexual revolution. The year was 1937. Al Capp, creator of the comic strip Li’l Abner, needed a plot point to move the story along in his November strip. Li’l Abner starred Abner Yokum, a small-town simpleton whose life revolved around fishin’ and not gettin’ hooked to his long-suffering girlfriend Daisy Mae. The Sadie Hawkins Day tradition fell into place. Al Capp invented a race wherein, if a woman could catch a man, she could wed him. Capp explained the reasoning behind the race in a three-panel historical flashback of the original Sadie Hawkins. Al Capp’s idea struck a cord, not just with the fictional residents of Dogpatch, but all around America. Keep in mind Al Capp came up with this back when it was frowned upon for a woman to even ask a guy out on a date or to a dance. Yet within two years of Sadie Hawkins’ original appearance, “Sadie Hawkins Day” was being celebrated at over 200 schools in 188 towns across the United States! (Life Magazine, Dec. 11, 1939.) Granted, at most of these institutions the girls didn’t marry the guys they caught. Instead, the schools held Sadie Hawkins Dances, in which girls would ask boys to the dance instead of the typical other way around. As it turns out, Daisy did not catch Abner that first Sadie Hawkins Day in 1937. 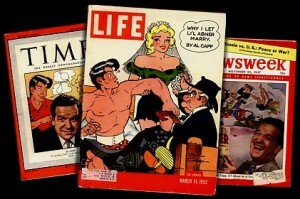 In fact, it wasn’t until 1952 that Al Capp bowed to public pressure and allowed Daisy and Abner to tie the knot, an event that made the cover of Life Magazine. Incidentally, Capp himself would not have fared well in any Sadie Hawkins Day race. As a nine-year old boy in New Haven, the future comic writer was run over by a trolley and lost his left leg. According to Chinese tradition, when a man proposes on The Night of Sevens, his bride to be is blessed by seven fairies from the heavens that brings luck in uniting their love forever. 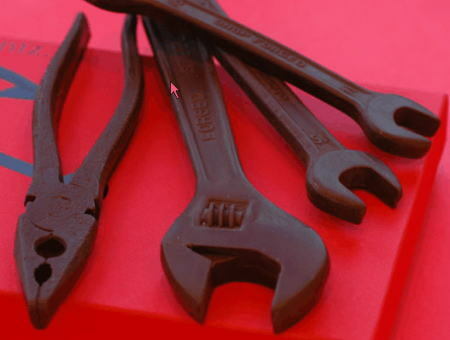 It’s Valentine’s Day in China. But it’s not named for a 3rd century Roman saint. 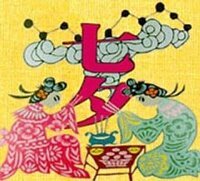 Today’s “Qixi” Festival (Night of Sevens) has its roots in the legend of the Weaver Princess and the Cowherd. The Princess grows to love the Cowherd and together they have two kids; however, when the Princess’s grandfather, the Jade Emperor (some sources say her mother) hears about the match, he is not happy. He forces the Princess back to the Heavens, where her job is to weave the clouds. The Princess is the star known as Vega. When the Cowherd, through some misadventures of his own, finally makes it up to the heavens to see her with their two kids, the Emperor separates them, placing a great river in the sky between them. The river is the Milky Way, and the Cowherd is the star Altair. Their two children are the smaller stars beside him. It’s said that the two lovers are allowed to meet only once a year, in mid-summer, on the 7th evening of the 7th moon in the Chinese lunar calendar. The traditions and rituals related to the festival have gone through several incarnations over the past 2000 years. 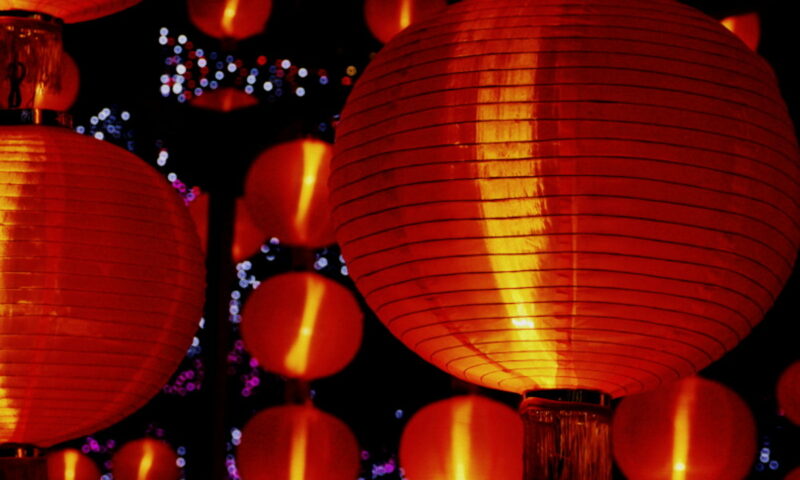 These days Qixi is a day of romance for lovers and can be compared in many ways to Valentine’s Day in the West. St. Valentine gets all the credit for bringing lovers together in the Northern Hemisphere, but in Brazil, that honor goes to Saint Anthony. St. Anthony is the patron saint of Lisbon, Portugal, as well as of lovers and newlyweds. He died on June 13, 1231 in Padua, Italy, at the age of 36. The eve before his feast day in early June is the perfect time for Brazilians to celebrate with their special someone. Especially since in Brazil, February 14 falls smack dab in the middle of Carnival season and people have enough holidays to worry about without getting in a passive-aggressive fight with their girlfriend because they forgot to get a gift. So next time your sweetheart is upset that you totally flaked on Valentine’s Day, surprise her on June 12th by explaining how you were waiting for the real lovers’ day: Dia dos Namorados. And if that doesn’t fly (and it won’t), break out Bardanza. You brought just for me. I couldn’t stand your silence.